I doubt that Journey was referring to Cornbread in their 1980 hit. Just look at that hair! I love it! LOL. But back to cornbread. Cornbread is one of those dishes that you can easily customize to suit your own tastes. Personally Mike and I prefer it spicy and cheesy, but the kids aren’t big fans of heat. So while we were in Maine we created a version that they would find more appetizing. This recipe is a blend between one that Greg over at Rufus’ Food and Spirits Guide created a few weeks back, and a the version that Mr. N and I made at his cooking class back in June. We started by mixing all the dry ingredients in one bowl – corn meal, flour, sea salt and baking powder. Then we mixed all the wet ingredients in another bowl – honey, eggs and buttermilk. Next we made a well in the dry ingredients, poured the wet ingredients into the well and combined. 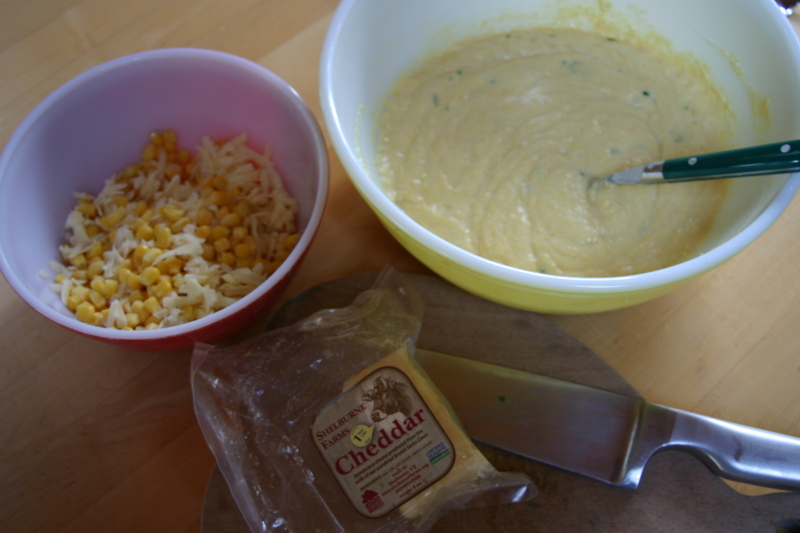 For our “custom” ingredients we used what we had on hand, frozen corn kernels, Vermont two-year aged Cheddar cheese and chives. We combined everything together and poured it into a greased cast-iron skillet. Greg’s fancy cornbread pan was my inspiration for this baking method. We baked the cornbread for 25 minutes at 425F. Make sure to use a good hot pad because this skillet will be HOT! 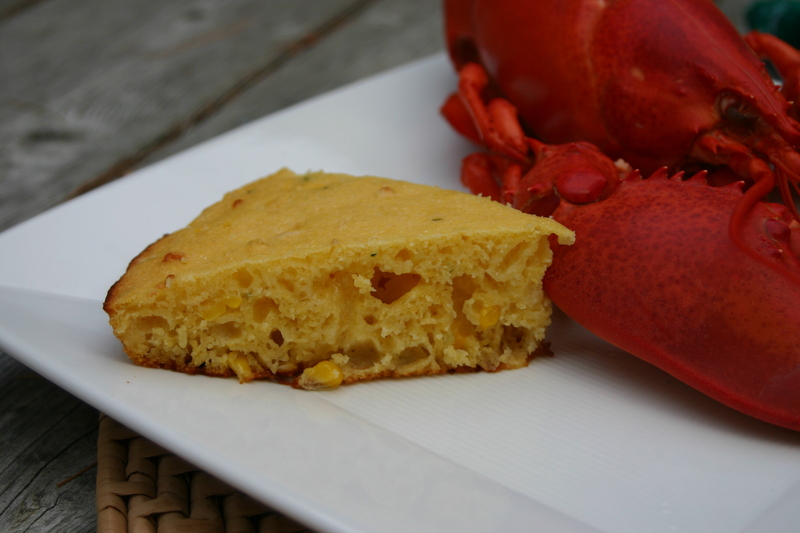 This cornbread was a great side dish for all of our lobster recipes. It would also make a great accompaniment to many other summer dishes. We served it hot and with lots of butter – real butter (it was vacation after all). Mike and I both enjoyed the cornbread. 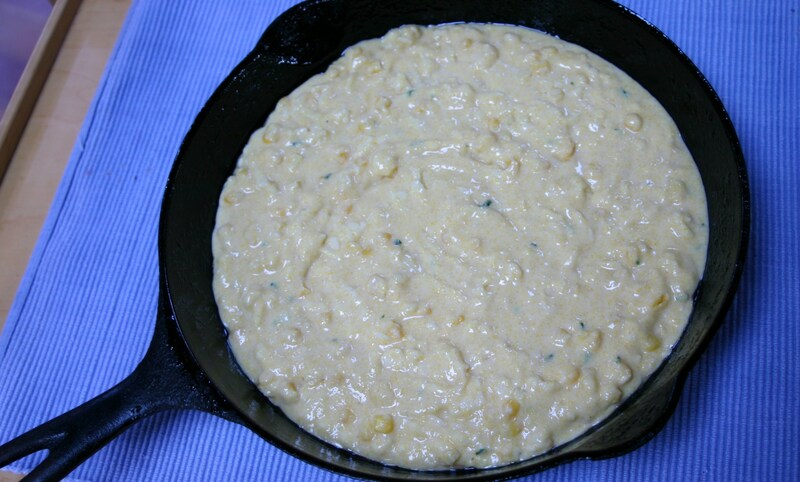 The cheese always adds a touch of creamy goodness to the course texture of the cornmeal. We each gave it 3 spoons. Mr. N likes anything with lots of butter so he too gave it 3 spoons. Miss A ate about half of her piece, but wasn’t really excited about it. It’s just not the same as her sourdough. So she gave it 2 spoons. Mike and I still prefer the spicy version (with jalapenos), but this was a nice mild version of cornbread. I’m sure we’ll make some variation of this again. That said, the fun part about cornbread to me is that each time we can make it a little bit different. The cheese is the definite magic…I can’t eat cornbread without cheese anymore. 😉 And I agree – served on a salad is awesome! Real butter is the way to go! And this bread looks amazing! 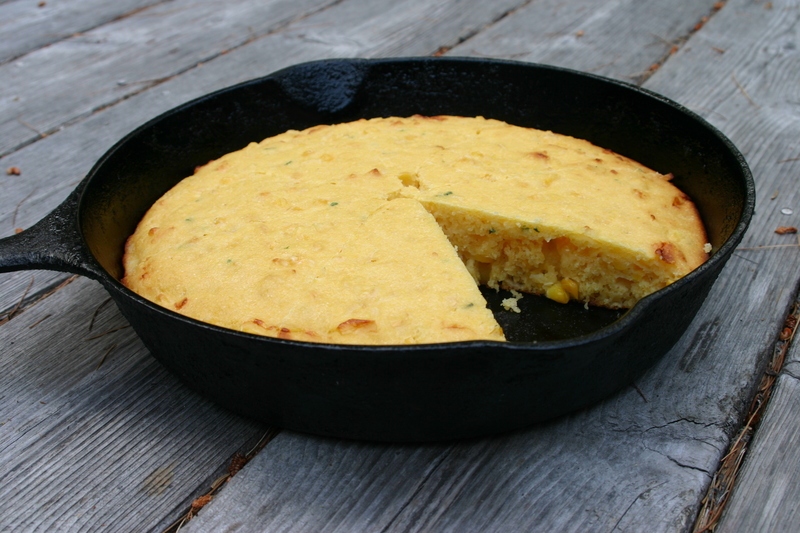 I use a cast iron skillet also for my cornbread; it just looks so fitting like you could cook it on an open fire! 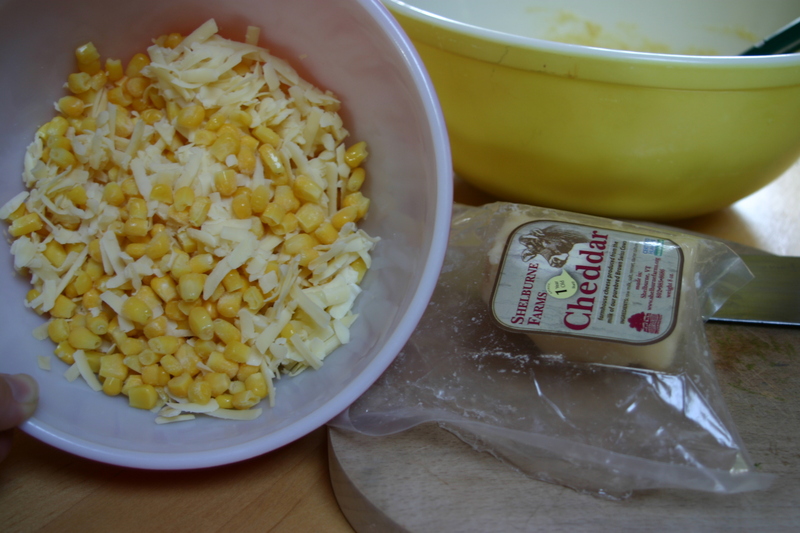 I like that you added in the corn for extra texture and a great choice in cheese!! 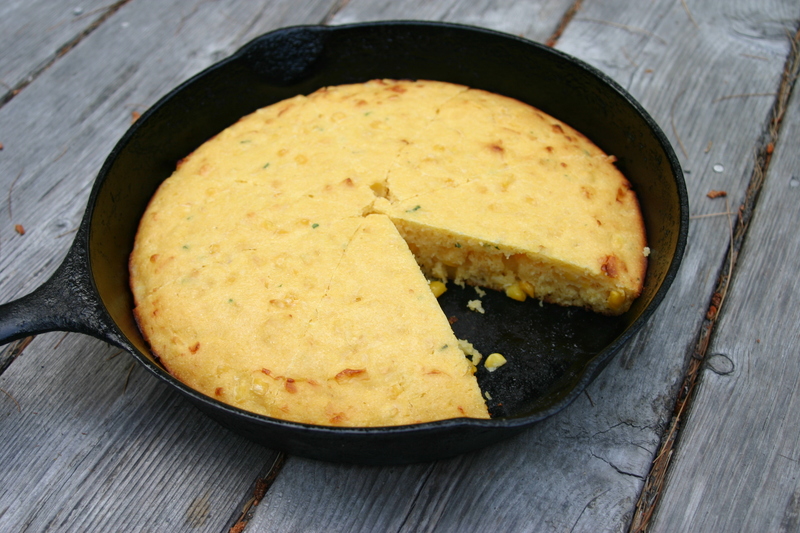 That’s exactly what it is – it gives the cornbread a feeling of the wild west or pioneer times. 🙂 Thanks Linda. I never liked cornbread as a kid…that was before I discovered you could load it up with cheese! LOL! Thanks Kathryn! I used these iron skillets a ton at our cabin. Now I need to get one for home! Everything is better with cheese. 🙂 The bread you did today looks amazing too!!!! Makes me want to bake another bread today. Love it, too. I am listening to Journey as I read your delectable recipe..
What a cool Idea 🙂 FABULOUS!!!!!!!!!!!!!!!!!!!! Your cornbread looks fabulous! A great side to any meal but with lobster – what a treat. Thanks Mandy! I hope you’re enjoying the weekend too! It looks like Pac-Man in the pan! And that lobster claw in the background is a nice teaser. I want three of those lobsters and two pans of the cornbread, and some butter. It all looks great and thanks for the shout out! Sure thing. Thanks for the inspiration.